TV, video and home audio systems deserve good quality speakers. These Bose home speakers offer clear sound from any angle and come with a clean well-designed look to enhance any room. Its cutting-edge design and top quality sound systems have made the Bose brand a household name since 1964. The Bose Virtually Invisible 591 Speakers are round in-ceiling speakers that include one woofer and two strategically positioned tweeters each for fuller, more even sound coverage. Designed to provide an immersive audio experience without interfering with the room’s décor, these in-ceiling speakers are a great addition to any home or indoor space. The 2.0 channel system has a modern and minimalist profile, offering clear sound without the clutter of additional speakers and wires. Conveniently connect a non-powered speaker to an amplifier or receiver with the raw cable jack. These white speakers add a clean, fresh look to any room and a touch of personality to an audio and home theater system. item 5 Bose Virtually Invisible 591 In-Ceiling Speaker (White). Authorized Dealer! 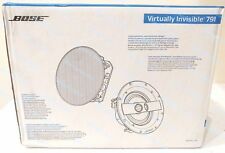 -Bose Virtually Invisible 591 In-Ceiling Speaker (White). Authorized Dealer!